Note: Here we are using VMware Converter Standalone Version 5.0.1. 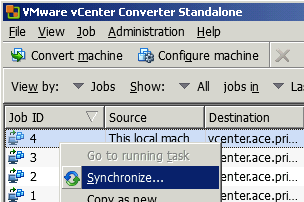 Quite a nice way to migrate a file server from 2003 to 2008R2 with minimal downtime, is to run an asynchronous VMware Convert (allows synching of delta changes until a chosen finalization point), and then simply attach the P2V’d data drive to a new Windows 2008R2 fileserver. Alas, it doesn’t always work which is why there are better paid for products out there (like Platespin Migate, Double-Take Move…) and it’s worth doing a trial run first! ii. When the original fileserver is ready to be decommissioned (after final VMware Converter Sync), power off, reset its AD account, join the new fileserver to the domain with same name and IP as the old one. 1. Install VMware Converter on fileserver to be migrated. 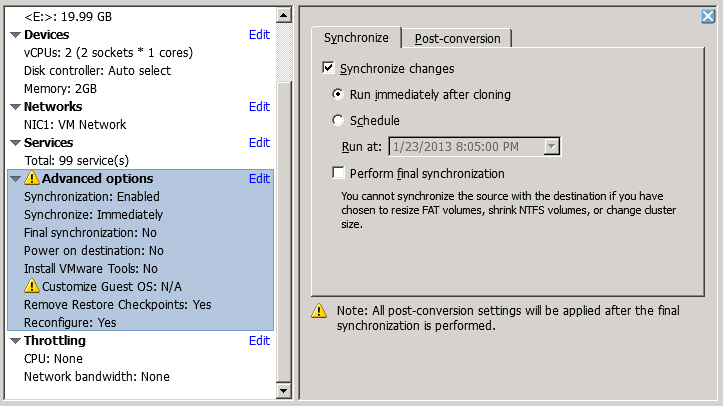 Note: The Synchronize will not work if the O/S disk is not selected, or shrinking NTFS volumes. 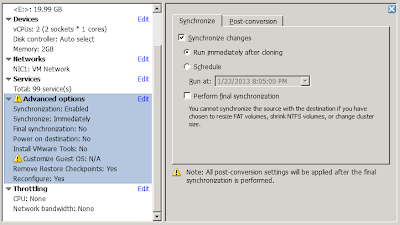 2.5 Conversion: Summary > Finish and let VMware Converter do its magic! And we can do this as many times as we like!